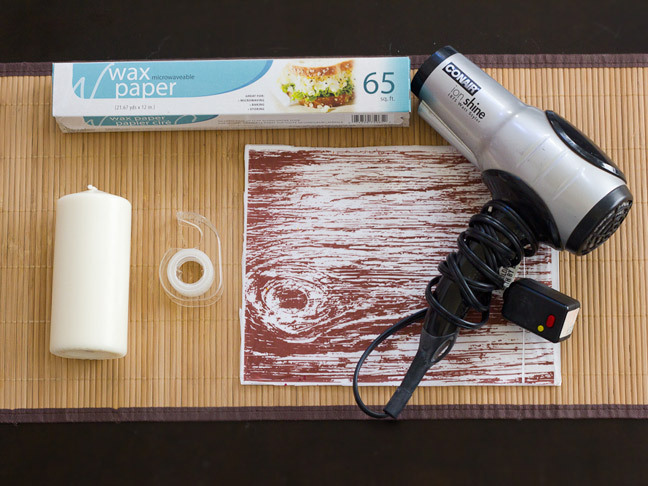 Step 1: Cut out a piece of tissue paper to match the size of your printer paper (i.e., 8.5″ x 11″). Gently tape it to the printer paper. 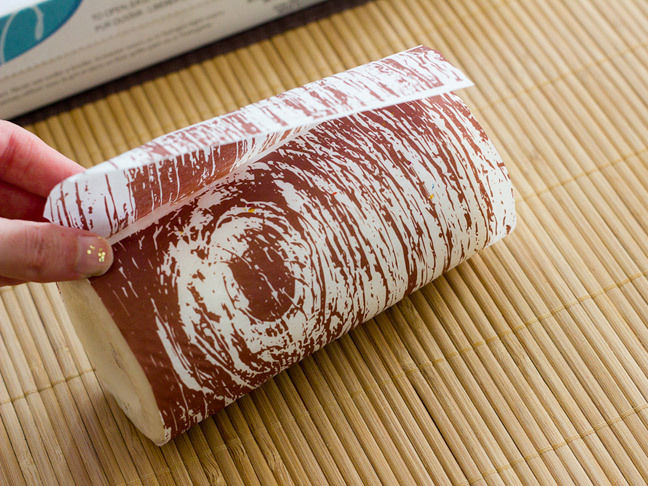 Feed your paper into the printer so that it will print on the tissue paper side. Step 2: Select a wood pattern to print out (choose from Wood Pattern A, Wood Pattern B, Wood Pattern C), and print it on the tissue paper on the highest quality setting. Step 3: Measure the height of the candle. Cut the tissue paper/printer paper to that height. 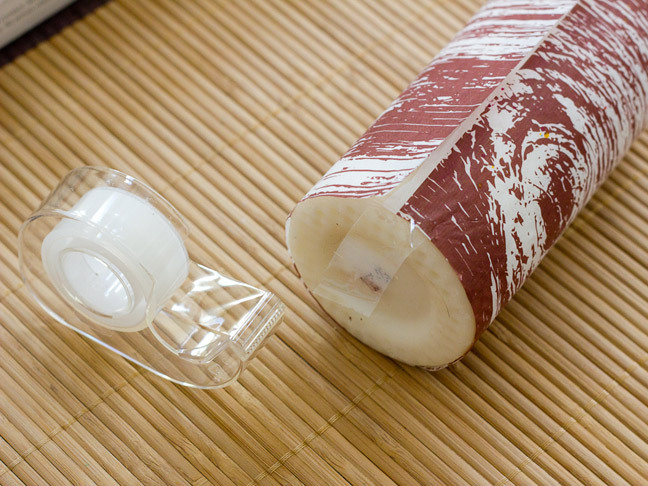 Step 4: Wrap the tissue paper around the candle and mark the length, then cut it with a small overlapping piece. Step 5: Gently tape the tissue paper to the candle at the top and bottom. Step 6: Using the hair dryer on its lowest setting, slowly melt the tissue paper on to the candle. You’ll be able to see it melting as the paper turns color as the wax melts through it. 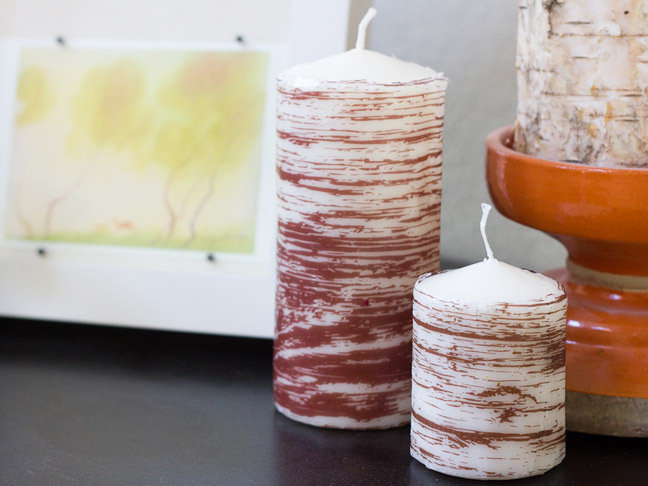 Step 7: Continue melting the candle until all of the paper is attached! 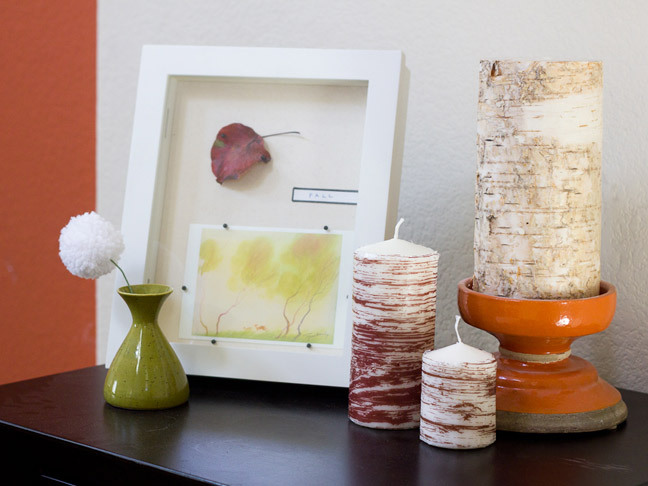 Then put your new faux bois candles out for display! Kimberly Michelle is a semi-normal 30-something mother/wife/girl and yearns for adding a little bit extra to everything she does. Kimberly loves creativity, kindness, and being "Goofy" on a daily basis. 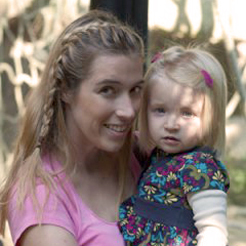 She's a lifelong Californian who enjoys the outdoors with her preschool daughter, husband of 7 years, and their Bernese Mountain Dog. She blogs about making every day extrordinary on her blog, KimberlyMichelle, and you can also find her on Twitter, Instagram, Facebook, Pinterest, and Google+.